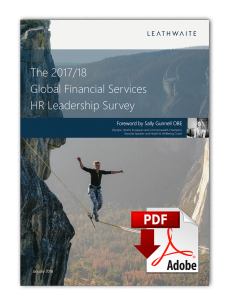 Between June and November 2017, Leathwaite polled in excess of 800 global Human Resources (HR) executives currently operating in HR leadership roles within Financial Services (FS). Respondents included Chief Human Resources Officers (CHROs), Heads of Specialist Functions (including Talent, Reward, Learning and Recruiting) and those at the vanguard of HR Transformation (including HR COOs and Heads of Analytics). We are pleased to release the findings of the survey, including a foreword by Sally Gunnell OBE, former Olympic, World and Commonwealth 400m hurdle champion.